Reform begins...Will a political career end? Late last night, the House of Representatives approved the healthcare overhaul legislation previously approved by the US Senate. As to no one's surprise, the vote was straight across party lines, a typical result given the bickering of the last 8-10 years. Frankly, it's quite disgusting how ALL of our politicians in Washington behave. I heard the other day something like: The farther in proximity you are from your political representatives, the less they have your interests in mind. In other words, the only way anything meaningful ever gets accomplished is at the city and county level. So true here in Georgia. The White House called it "the most significant health reform legislation this country has seen in decades." While this may be true, the long-term results will likely be determined at the polls the next few elections. We'll see. 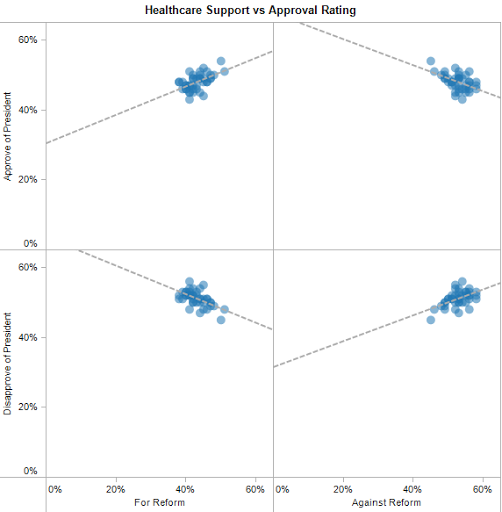 How has the healthcare debate impacted President Obama's approval ratings? The Guardian Datablog provides us the data. 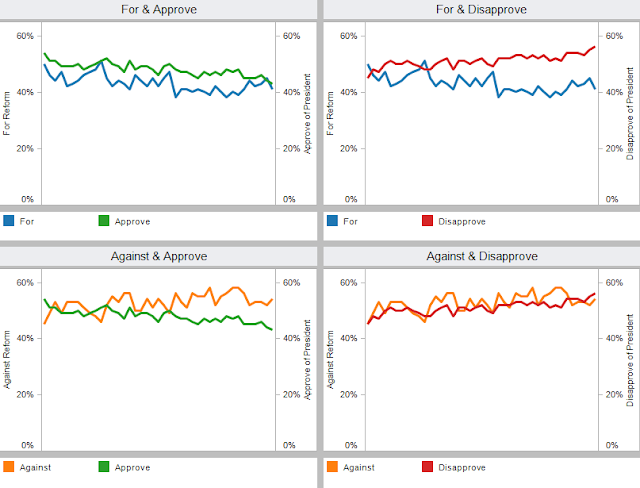 First, I looked at the relationship between all four data points: For/Against the legislation and Approve/Disapprove of the President. The upper-left and lower-right quadrants tell the story. Those that approve of the President are in favor of reform. Those that are against the President are against reform. I bet the majority those on the upper-left are Democrats (and watch MSNBC) and those in the lower-right are Republicans (and watch Fox News). Such a polarizing society we have become...sigh! From there I looked at the trends in the polling. The poll results start June 27, 2009 and continue through March 20, 2010. Do these trends support the scatter plots? Well, not really. Again, on the upper-left of the dashboard there appears to be a strong correlation between those that are for reform and those that approve of the President. However, it's clear that support for both the President and reform have been waning, even for his most ardent supports. However, the revelations in the scatter plot are supported by the polls for those that are against legislation and disapprove of the President. See the bottom-right of the dashboard. What does this all tell us? It tells me that politicians only look out for themselves; they make the decisions that they think will get them re-elected. A record $3.47 billion was spent lobbying Congress last year. Not all of that was about health care, but a hefty chunk of it was, and the vast majority of it by corporations and associations that wanted to kill the bill outright or shape it to reflect their financial priorities. Maybe this is the real impact on the results we're seeing.